My family is avoiding the topic of going back to school. Ready or not it will be here before you know it so I guess it’s time to get prepared with new clothes and supplies. I’m also compiling a list of super easy weeknight meals just like this Easy Chicken Enchilada Casserole so I’m not stuck with a pile of homework, kids to shuttle back and forth and nothing ready for dinner! The other day while I was at Walmart I picked some groceries and other odds and ends. I grabbed Campbell’s® Condensed Tomato Soup, Pace® Picante, and a few cans of Swanson® Premium Chicken so I could restock my pantry with all the ingredients I need to make this casserole. 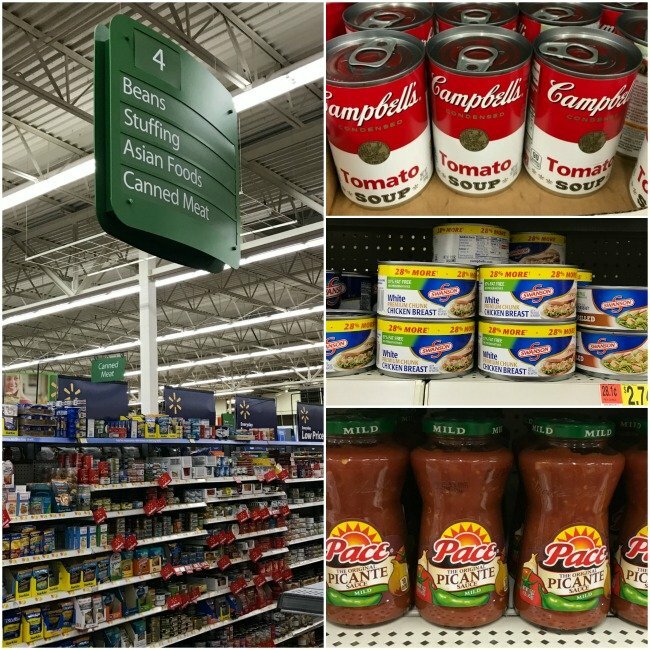 Ready to shop for delicious Campbell Soup Company products? Hover over the photo below to click through to Walmart.com and purchase them! 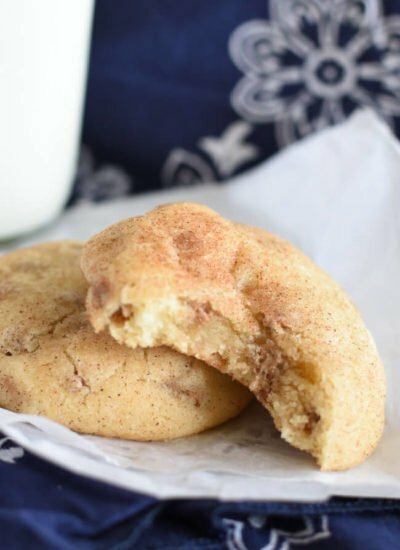 This recipe uses just a handful of ingredients which makes it super quick to throw together. 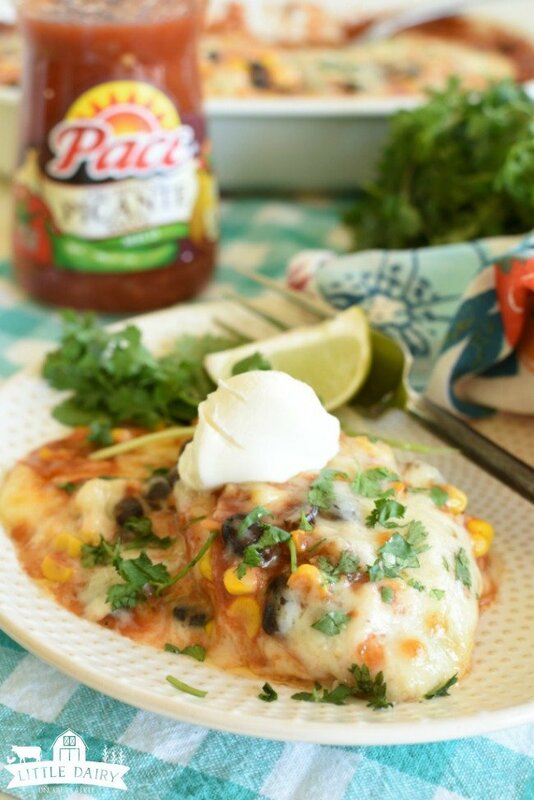 Pace® Picante is one of my favorite items in our pantry because it’s so versatile. My boys obviously love it with chips or as a condiment on all kinds of foods. I use as an ingredient because I know it will add a quick kick to dishes! One of my very favorite shortcuts on busy days is using Swanson® Premium Chicken. It makes meal prep extra speedy since it’s already cooked and ready to use for quick everyday meals like this one. Let me show you how to make Easy Chicken Enchilada Casserole! Mix Campbell’s® Condensed Tomato Soup, a little Pace® Picante, and taco seasoning together. Add chicken, corn, and black beans. Break chicken up a little with a fork if needed. Spread a little bit of the chicken mixture in the bottom of a baking dish. Set corn tortillas over chicken mixture. Add another layer of chicken mixture. Sprinkle cheese over chicken mixture. Repeat layers, starting with tortillas and ending with cheese, two more times. Serve warm. 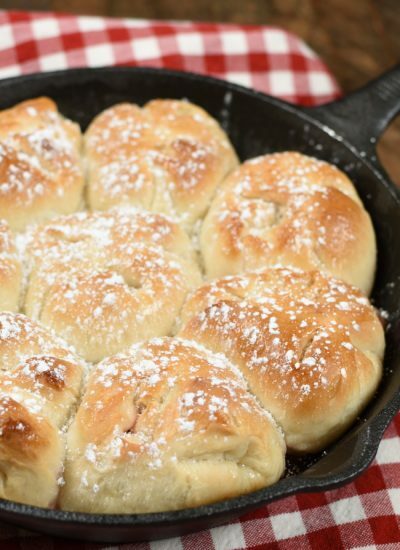 This is delicious served with a green salad or with a side of Cheesy Spanish Rice! 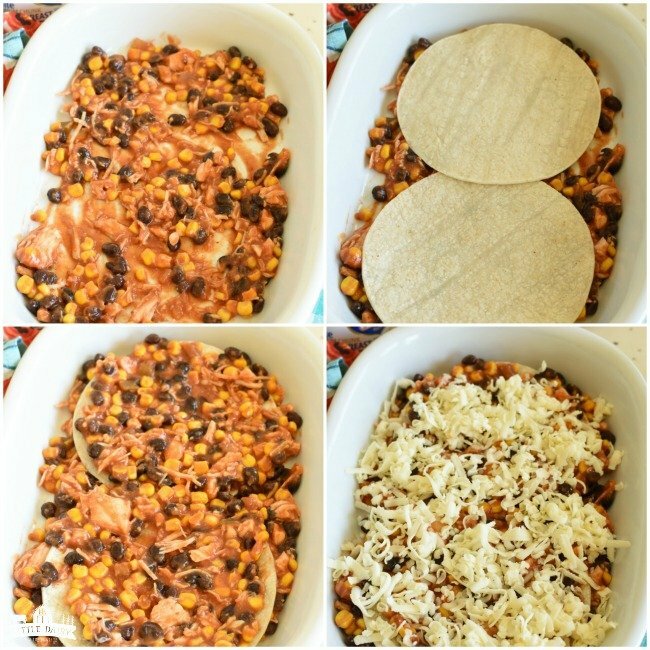 Easy Chicken Enchilada Casserole is a shortcut, make ahead meal. It’s just what you need when it’s time for back to school! My family wishes the summer could last forever. We need our kids to help us on the farm, we love having them around, and they’d rather work on the farm than go to school anyway. Back to school brings a whole new level of crazy busy. It’s almost like we are forced into having a schedule because the kids have piano lessons, and homework, and chores. We have to balance that back to school schedule with the hectic summer “no schedule” on the farm. It’s fair to say that our schedule is brutal until we complete our harvest in the fall. Being able to make a weeknight dinner, stick it in the fridge, and go on with my day makes helping do algebra homework in evenings much easier! So whether you need a make ahead so you can be a substitute tractor driver since your kids are in school and can’t drive it, or whether it’s your turn to drive the preschool carpool, or volunteering in the classroom this Easy Chicken Enchilada Casserole will make you life easier and yummier! 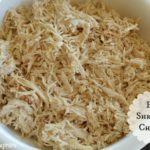 Make sure you print the Easy Chicken Enchilada Casserole recipe so you’ll have! 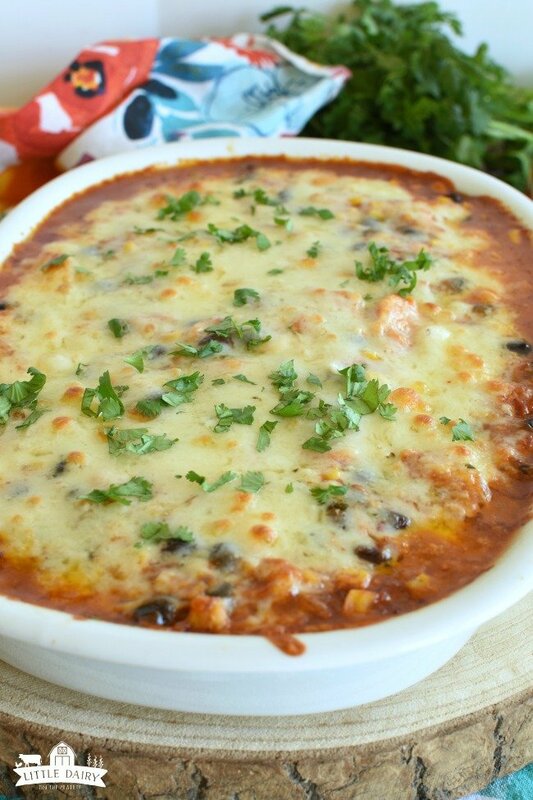 Make sure you print off the recipe for my Easy Chicken Enchilada Casserole Recipe! 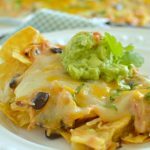 Easy Chicken Enchilada Casserole is one of those make ahead, shortcut meals you will come to time and time again! It's easy and the whole family will love it! Preheat oven to 375 degrees. Grease a 9 x 11 inch baking dish. 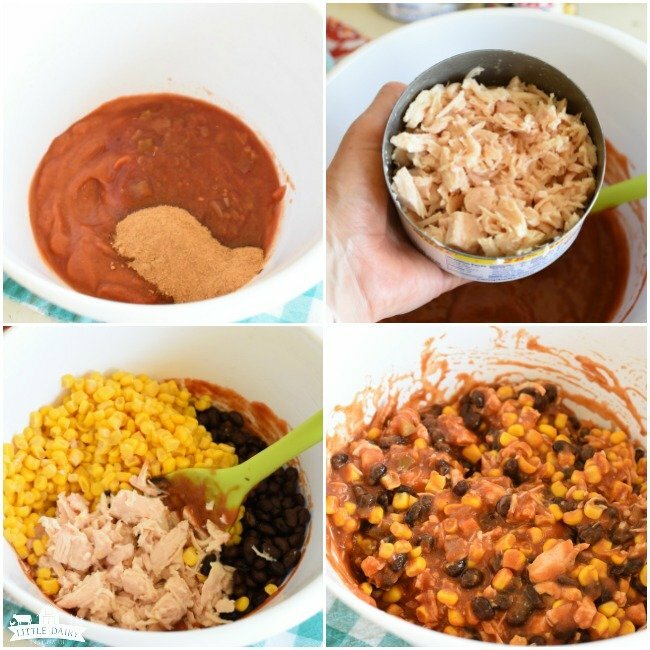 Mix soup, ¼ c. salsa, and taco seasoning together. Add chicken, corn, and beans to soup mixture. Stir. Spoon about just enough chicken mixture to cover the bottom of prepared baking dish. Spread into a layer. Set two tortilla shells over chicken mixture layer. Spoon chicken mixture over tortillas. Spread to the edges of baking dish. Repeat layers two more times beginning with tortillas and ending with cheese. Who has time for rolling enchiladas on busy nights anyway? This casserole shows up for dinner on busy nights quite often because it’s so easy and everyone loves it! This is my kind of meal … simple, delicious, and not a whole lot of work! Saving it for those hectic back to school nights! We could be soul sisters in the kitchen! Who has time for elaborate meals anyway? Especially if they can taste this good without too much effort! 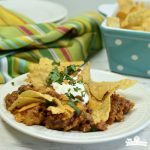 I make enchiladas often but this casserole idea is genius, especially on those busy school nights! I do love me a good casserole and you’ve assembled one with amazing flavors. Yum, yum. 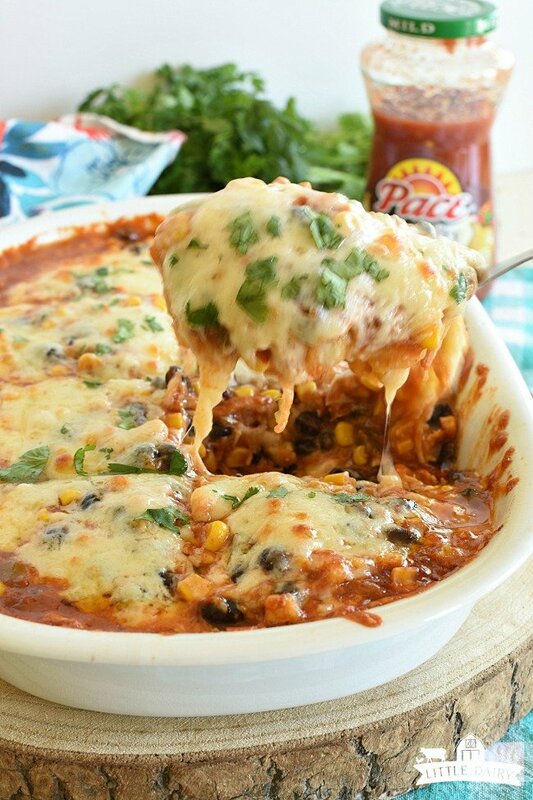 This enchilada casserole looks super delicious! I love Pace Picante sauce and that canned chicken. Mmmm. Beautiful photos. Thanks Elaine! I could eat salsa everyday and still love it! 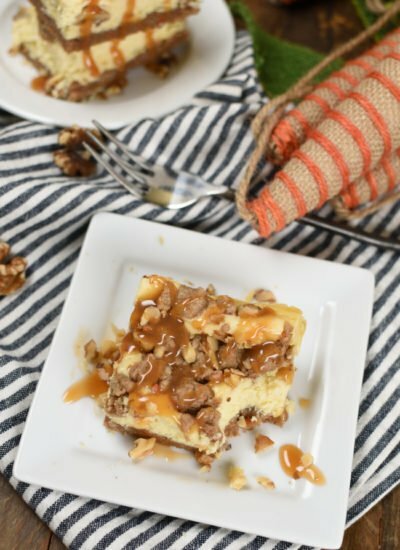 This casserole is awesome for families! Love enchiladas and these look the bomb. 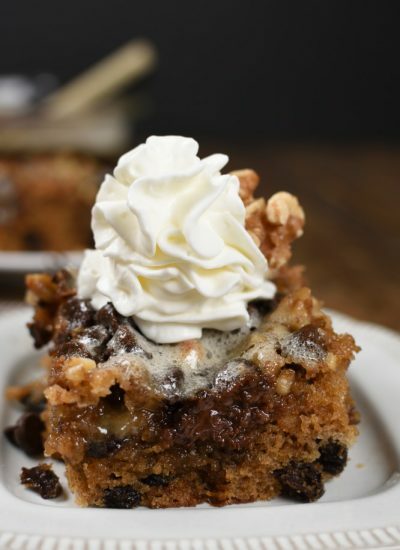 Time to get the ingredients and make this for my family! 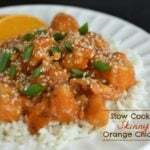 It’s quick and easy meals like this that make my life easier and my family happy! 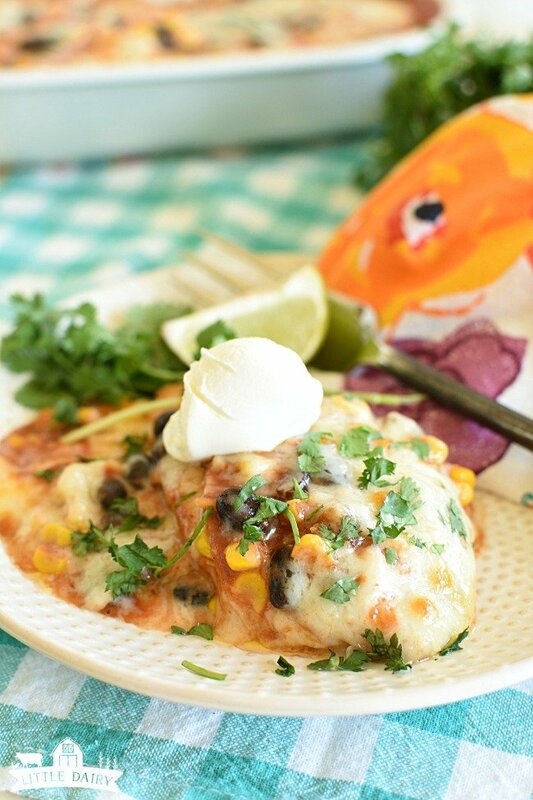 There’s almost nothing better than a cheesy chicken enchilada and this one looks incredible! I agree! Mexican food is my favorite, especially if it’s this easy!